Welcome to the Love Lust and Laptops #Hot for the Holidays Blog Tour. 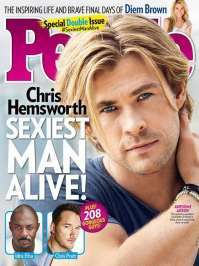 My hot hunk for the holidays is Chris Hemsworth, People Magazine‘s current Sexiest Man Alive. See the People TV video of Chris to see why this Aussie is so HOT. Chris is also the inspiration for Stuart Alan Walsh aka Tweeter in Storm Warning, Book 4 of the Security Specialists International Series. So, when reading all the SSI books in which Tweeter is featured, just image the shaggy-haired Chris wearing jeans and a tight T-shirt and you’ll have the perfect mental picture of this alpha-geek hero. Click on image to get link for this Wallpaper image. Do you like FREE Reads? If you haven’t had a chance to read any of my SSI books, iBooks is featuring my Eye of the Storm, Book 1 in the series, for FREE as part of its Discover a New Author for Free feature through December 15th. Here is the iBook LINK for Eye of the Storm. You can purchase thru the iTunes store on your computer or through the iTunes app on your tablet or phone. You can also download two FREE novellas in the SSI series, Stormy Weather Baby (Book 1.5) and Storm Front (Book 2.5) from my publisher, Liquid Silver Books. Here’s the LINK. Make a comment here and you will be entered to win a download of my most recent, Prime Imperative, Book 3 of the Prime Chronicles series. In order to qualify for one grand prize from the Ladies of LL&L, please visit all our participating blogs and comment there. Grand Prize: Downloads of Prime Imperative by Monette Michaels, Bayou des Enfants by Lynn Lorenz, Predator’s Fire, Gemini Island Shifters 5, by Rosanna Leo, Straitlaced by Robin Danner, Seducing Kate by Emilia Mancini, Christmas in Cancun by KaLyn Cooper, Prymal Lust by Jianne Carlo, Come by Becca Jameson, Double Up by Vanessa North, and Cowboy Redeemed by Parker Kincade. At the end of the hop (end of day Dec. 10), we will draw a winner and award the prize. Each Love, Lust and Laptops author will also be doing their own personal giveaway, to make the event even sweeter. How to find all the participating blogs? Simply click on the pics below or you can Go To the LL&L #HotfortheHolidays blog, and follow the links from there. ~ by Monette Michaels on December 6, 2014. And a Happy Holidays to you, too, Christine. Thanks for stopping by. Thanks for this awesome Blog Hop!!! Hope you all have a happy holidays 🙂 ! Thanks for stopping by, Krystle. Happy Holidays. Thank you for this awesome blog hop!! Monette, love your storytelling. Thanks for all you do. Thank you, Robin. So glad you stopped by and commented. I always love to hear my stories are appreciated. Happy Holidays. Thanks for the links to your free reads. Merry Christmas! You’re very welcome. Hope you enjoy them. Merry Christmas. Tracey, don’t be embarrassed. At least now you can see why I would want my hero to look like him. And since reading the People article on him, I like him as a person since he is such a family man. Sigh, a hunk with a heart. Happy Holidays. Thank you for being part of the Hot for the Holidays blog hop. Thanks for commenting, Angie. Happy Holidays. Thanks, Savannah for stopping by. While the grand prize winner for the hop has been chosen– congrats Krystle — I am leaving my individual blog open until midnight for comments and will choose a winner tomorrow, December 11th, and announce it here and on my FB page. Looks awesome! Your characters sound great! Cant wait to read em! Thanks for sharing! Thanks for stopping shadowluvs2read. Happy Holidays. Donna (biblio….) is the winner. I just sent you an e-mail about the format you need for Prime Imperative. Thanks for hopping with the ladies of Love Lust and Laptops.